Dr. Shashidhar - What is Heart Failure? 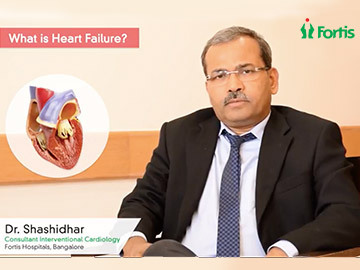 Dr. Shashidhar Explains What is Heart Failure? Dr. Shashidhar is an eminent Cardiologist and Electrophysiologist with extensive experience in Complex Arrhythmia Ablation with 3D mapping systems. He also holds the distinction of performing the first home monitoring Device-Cardiac Resynchronization Therapy Device (CRTD) - implantation in South India. He has earlier worked at Narayana Hrudayalaya and Manipal Heart Institute, Bangalore. 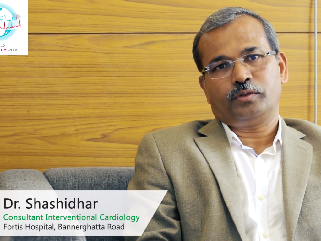 After finishing his MD in general medicine from Government Medical College, Mysore, Dr. Shashidhar went on to complete his DM in cardiology from GSVM Medical College, Kanpur. He completed his Fellowship in Cardiac Electrophysiology (FCE) over a period of two years from Australia and an Observership in Cardiac Electrophysiology (OCE) over a period of 3 months from France. He has many publications and abstracts to his credit in the field of cardiology. Dr. Shashidhar is also a member of many international and domestic associations in his related field. As a cardiologist, Dr. Shashidhar is an expert in Coronary Interventions and Electrophysiology. His special areas of interest include Atrial Fibrillation Ablation, Ventricular Arrhythmia Ablation and Cardiac Defibrillator/ Biventricular Device Implantation.